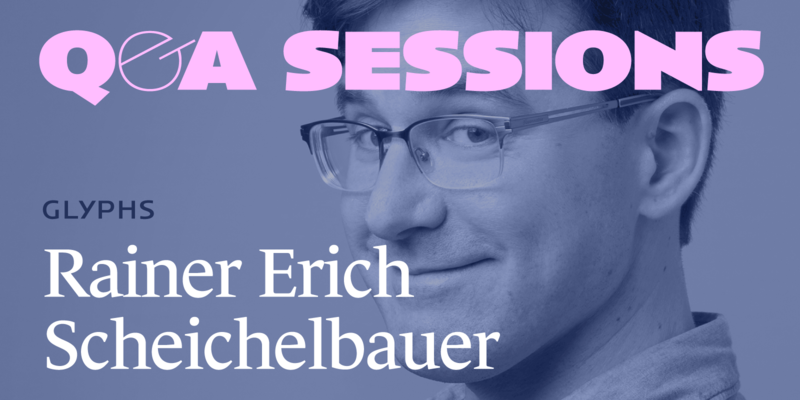 We talked to the very talented Rainer Erich (‘Eric’) Scheichelbauer. Rainer Erich was born in Vienna, and studied photography, philosophy and Dutch. Today, he creates and produces typefaces, teaches type design, and occasionally translates Dutch books on typography into German. Eric joined the Glyphs team in 2012, and has been writing tutorials and the handbook. He recently started his type service office Schriftlabor with three other designers in Vienna. Rainer Erich: There is something very appealing and convincing about good typography that is pretty hard to explain. The same content can come across as trustworthy or reliable because of good typography or as totally nuts with bad typography. I am pretty happy with now. Typefaces have never been better. Going back in time would have so many drawbacks. To tell you the truth, I find people suspicious who proclaim that everything was better in the past. Oh yes. I have always worked with vectors, you name it, infographics, illustrations, comics, typography. But now I am focussing on type design exclusively. That is still vectors, but very different stuff than I used to do, and I do it much better and faster than I used to do it. That is partially due to the software I use, and partially due to my better understanding of PostScript vectors and the math behind it. This, in turn, stems from my 16 years of teaching in Vienna. I would not have delved so deeply into the subject if I hadn’t been in a situation where I had to explain it to someone else. Rinaer Erich at TypeCon ‘14. Photo by Helen Lysen. Do not get me started about cinema! I love the French cinema, the subversive humor of Claude Chabrol, the quiet style of Agnès Varda, the subtlety of André Téchiné, Krzysztof Kieślowski’s monumentalism. I am a big fan of Woody Allen. I also like Hal Hartley, and lately Wes Anderson. Oh, and the Monsieur Hulot films still crack up. There are some Austrian films that are great in their total weirdness. I don’t get to watch much TV. Last thing I saw was Borgen, the Danish TV show, which was very good. And there is a great Austrian show called Schlawiner. My first paid commission ever was adding diacritics to a font, and making sure it would work on Windows 95 and in Quark XPress 3 on the Mac. That was tough. I am pretty happy about how the Sephora typeface system turned out. That was a commission I did together with Matteo Bologna’s Mucca Design. Anything beautiful in life, really. A walk through a forest. A good dinner. An entertaining comedy evening. A good game of football, even. You name it.